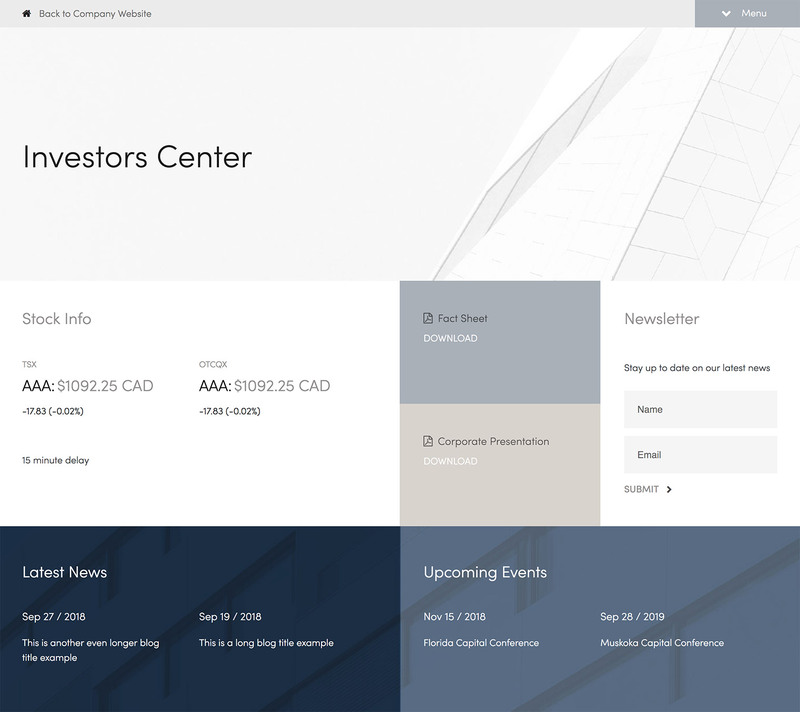 There are many phases within the investor relations process, and Piknic understands that website solutions are necessary for each stage of the development. Whether you’re a start-up, in the IPO process, or have elevated the growth of your company, Piknic has the pertinent products for your needs. Piknic’s deliberate website designs support industries such as mining, cannabis, blockchain, technology, healthcare and many others. 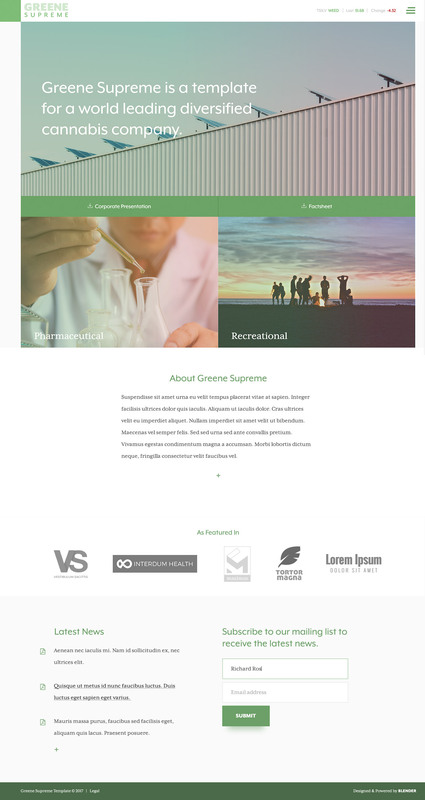 When there’s a need for a full website design now, companies often choose this option. All websites in the investor relations sector are required to have an IR section with the mandatory stats and figures of your company. Having an IR microsite is a great representation to showcase your brand and stand out from your competitors. Piknic is updated with the latest best practices and understands the particulars that are essential to creating the ideal microsite. Planning on building a full website but also need one in the interim? A Placeholder website should be considered because it is a temporary site that is designed to have all of the crucial information of your company. Situations when this option is often used is when online presence is a requirement in your IPO process. Placeholder sites can be quickly built while your full website is in development. 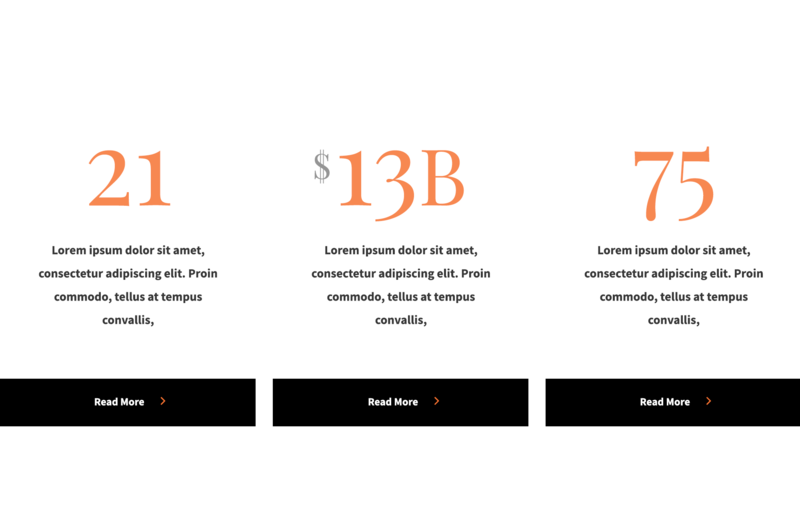 Creating more dynamic elements to your website that aren’t already included in the template may help enhance your website experience, add more dynamism, or increase interactivity time on your site. Supporting you every step of the way: BlenderCMS and the best IR support in the business. Blender Media created Piknic as a solution for companies who wanted high quality websites, built in less time, with an easy to use process. With the success of Piknic, we made it our mission to push these ‘Piknic Principles’ of high quality, ready to use website designs beyond the front end capability by also including the maintenance and management aspect and overall user experience. We wanted to make it simple for our clients to fulfill the day-to-day tasks that come with managing an IR website—such as updating text, numbers, photo galleries, and more—without needing tons of technical knowledge or hours of training. We wanted website management to be just as easy and intuitive as Piknic, so we created a content management system (CMS) from the ground up that was specifically built for public companies and IR. Welcome to The BlenderCMS. We also understand that even after your website is launched, and you’ve mastered daily website changes, you’re still going to have questions. The most crucial element of the Piknic ‘ease of use trifecta’ is our Updates team. The Blender and Piknic Updates Team are in-house experts who are ready to help you with any IR website challenge, big or small. The Updates team is well-versed in both the BlenderCMS and in IR best practices. They’re the ones to come to with the smallest technical request, or a big picture investor relations question. They truly are the best in the business, and they’re standing by now ready to prove that to you. Since we deal entirely in digital, it can be easy to forget that there are real people on the other side of the phone ready to help you. But trust us, we’re here. There’s a whole team of experts (across time zones!) in the Blender offices whose main focus is our clients’ success. Can’t figure out a function of the BlenderCMS? Many of our Updates Team helped build the CMS tool, and can easily help you navigate it. Wondering if your message uses the correct IR terminology? Talk to our Updates Team, who are highly trained in the industry and know IR best practices, jargon, and know-how. With the Updates Team, you can also feel confident that we’ve got your website covered, even if you aren’t there. When you’re planning your next road show, preparing for a conference, your website is the last thing on your mind, trust that our team is working behind the scenes to efficiently fulfill all your digital tasks. The BlenderCMS is an easy to use tool that helps you and your team manage your company’s website and make changes all on your own. Here’s how it works: you get your own login to the backend of your website. You’re then able to use all aspects of the CMS to make changes to pages, text, fonts, colors, numbers, and more. If that sounds intimidating, don’t worry: we’ve specifically built the CMS so it’s a breeze to use with drag & drop functionality. We’ve also included tools to ensure no one at your company accidentally publishes or releases anything without every stakeholder’s approval. The BlenderCMS knows the types of website changes and additions public companies need to make day-to-day. 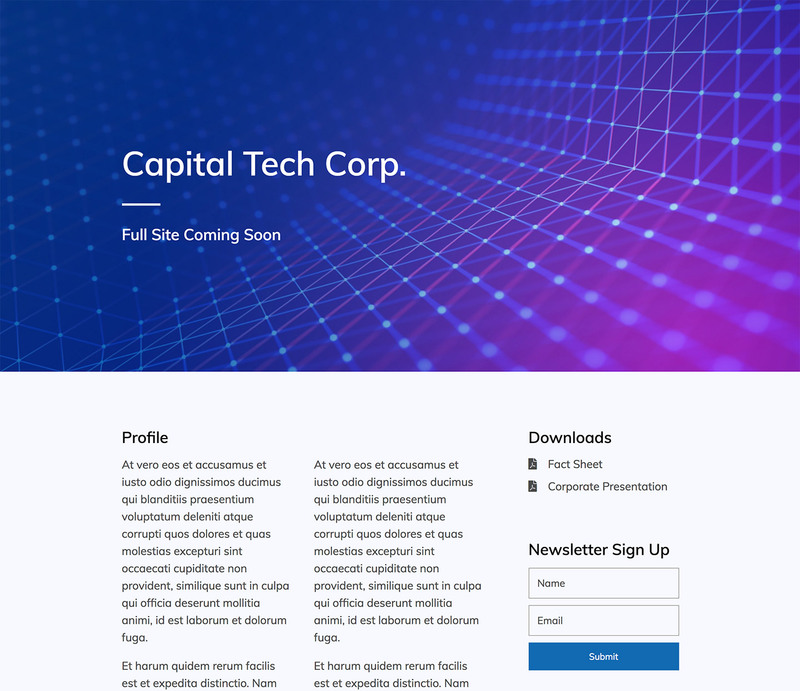 We researched and carefully considered all potential resources before integrating tools such as news release scheduling, stock charts, investment highlights, company snapshots, and more valuable info for potential investors and current shareholders. With any other CMS, you’ll need to figure out how to incorporate public company specific info within their system. With The BlenderCMS, it’s already right on the page. The BlenderCMS includes the ability for multiple stakeholders to log in and review, comment, and edit on website changes on a ‘staging site’ before the changes are published to the live website. The staging site functionality also allows users to draft future releases and pages and queue them up for publication. With this functionality, you can feel confident that no accidental or unnecessary changes will be published without a sign off from all involved. The BlenderCMS is search engine optimization (SEO) friendly, meaning that just by using our CMS you already get the benefits of built-in tools that help your website rank higher on search engines like Google. Our CMS developers understand what Google looks for in a website, so when building the BlenderCMS they included information like custom titles, meta descriptions, URLs, keyword placements and image alt tags. Easily monitor website traffic and see where your users are coming from The CMS developers also made BlenderCMS compatible with Google Analytics, so you can log in and track how your website within the CMS and can view site visitors, traffic, what devices people are using to view your website, as well as what geographical location they’re coming from. For a full list of what The BlenderCMS can do, visit our CMS page. Try out the BlenderCMS, and call our Updates Team today! Blender’s goal is and always has been, to create new and innovative ways to save public companies time, energy, and to take the pressure off building and maintaining IR websites. From Piknic’s ready to use templates, to The BlenderCMS easy drag & drop with website editing functionality, to the hands-on help of our Updates Team, we are here to make the process painless, every step of the way. If you have any further questions about how to use the BlenderCMS, how to create a Piknic website, or how to work with Blender Media, please contact us contact us at 778-588-7024 or email [email protected]. Piknic was created by Blender Media, North America’s leading agency for public companies. Blender creates world-class products and is recognized as a thought leader in the digital marketing and advertising space. The award-winning company continues to innovate and stay progressive while maintaining a level of quality design and customer relations experience.